The global E-cigarettes market was valued at USD 10.24 billion in 2017, and is expected to reach a value of USD 16.85 billion by 2023, at a CAGR of 8.1%, over the forecast period (2018-2023). 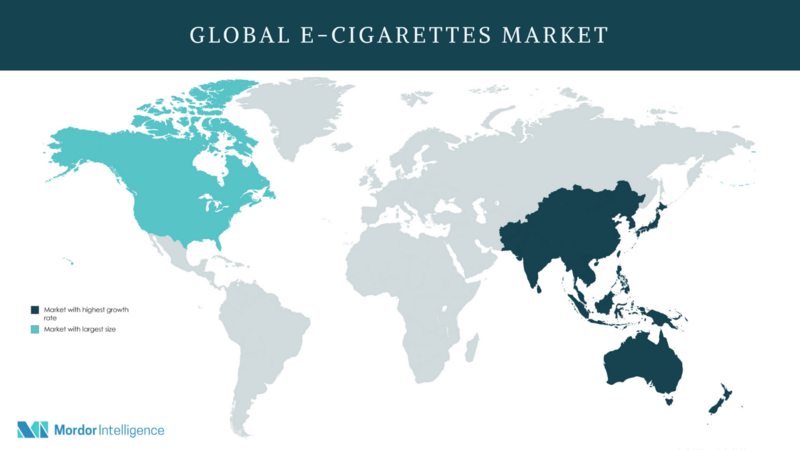 The e-cigarette market has witnessed a significant growth over the past decade, owing to the growing health concerns over the usage of conventional tobacco-based cigarettes. Increasing adoption of e-cigarettes has created a market for disposable, reusable, and customizable e-cigarettes. The market is evolving at a fast pace and is expected to see innovation in vapor delivery and other systems in the years to come. In addition, with many large enterprises realizing the potential of e-cigarettes, huge investments have been pumped into this industry. Many large tobacco companies have released their own brands or acquired existing companies over the past few years. In the aftermath of increased awareness about the product, heavy investment has resulted in high marketing budgets for companies in this industry. This has augmented increasing adoption of e-cigarettes across the world. According to the Center for Disease Control and Prevention, tobacco is the primary cause of preventable deaths in the United States. It has been reported that more than 16 million of the US population suffer from diseases caused by smoking. Tobacco contains over 7,000 chemicals in tobacco smoke, out of which, at least 250 are known to be harmful, including chemicals like hydrogen cyanide, ammonia, and carbon monoxide. Tobacco contains at least 69 cancer-causing chemicals. This has caused serious concerns among various governments and organizations conducting awareness programs to halt the usage of tobacco. E-cigarettes are considered to be less toxic and safer than a conventional tobacco cigarette, which has made e-cigarette a viable alternative. A research study concluded that the people who smoked only e-cigarettes had similar levels of carcinogens to people using nicotine-replacement therapies, and had much lower toxicity levels than people who only smoked cigarettes. This is expected to be one of the driving factors for people opting e-cigarettes over conventional cigarettes. Disposable e-cigarettes offer the same amount of emanation as two packs of traditional tobacco cigarettes, which make the former very economical. The reduced toxicity levels, combined with cost concerns, are driving the e-cigarette market forward in many regions. Automatic e-cigarettes are similar in operation to that of conventional tobacco cigarettes. Automatic e-cigarettes are relatively easier to use as they have an in-built switch that gets activated each time the user draws on the e-cigarette. Thus, the users can easily get their nicotine dose without going through the hassle of complicated buttons or mods on the unit. With the automatic e-cigarette battery, one can smoke by simply adjusting the cartomizer on the unit. Automatic e-cigarettes are activated by inhaling, and thus, simulate the experience of smoking a traditional cigarette. The ease in usage has rendered automatic e-cigarettes to be the most popular type of electronic cigarettes in the market. They also have very low electricity consumption, which allows for a comparatively longer vaping period between charges. These advantages have heavily influenced consumers’ preference for purchasing automatic electronic cigarettes. The growth of these models is further facilitated by the majority of new users adapting to using the automatic battery version instead of the manually operated cigarettes. However, they have certain limitations, such as the vulnerability to liquid leaks and the need for priming the device before usage, which are the primary reasons for the low growth rate of automatic e-cigarettes in the market, as compared to manual cigarettes. The e-cigarette market in North America has the majority share. Even though e-cigarettes were invented in China, the United States gave the required boost for the market in its early stages. Since 2006, the US e-cigarette market has grown to become a major market with an unprecedented growth rate. This growth was made possible with the advent of industry giants from the tobacco, pharmaceutical, and other major influential sectors in the country. Established tobacco players are strengthening their market position with various acquisitions and are launching new brands. The United States owns the largest e-cigarette distribution networks for sale. Currently, more than 3,000 e-cigarette flavors are available in the US market, and nearly 300 new flavors are being introduced into the market every month. This trend is an indicator of the demand for flavored products among end users. On an average, 7 out of 10 people prefer flavored products to others. The level of advertising for e-cigarettes is low in Canada, particularly in television and print media. Majority of the promotional activities take place online and retail outlets or at the point-of-sale. However, with increasing marketing of these products as a healthy alternative to regular smoking, the Canadian market is expected to register tremendous growth over the forecast period. July 2017: British American Tobacco acquired remaining 57.8% of Reynold American Inc. This acquisition is expected to create a strong global tobacco and next-generation products and the company is focused on delivering long-term profit growth and returns. July 2017: Phillip Moris International planned to invest approximately EUR 490 million to transform its cigarette production factory in Otopeni, near Bucharest, Romania, into a high-tech facility to manufacture HEETS, the tobacco units used with the electronic tobacco heating device, IQOS. March 2017: Vapor Corp. changed its corporate name to Healthier Choices Management Corp., to reflect its focus on managing healthy food markets and other healthier lifestyle alternatives. E-cigarette Market Major Players: Philip Morris International, Healthier Choices Management Corp (Ruthless Vapor Corp), MCIG Inc., ITC Limited, Altria Group Inc., British American Tobacco PLC, Japan Tobacco, Inc., J Well France, And Imperial Tobacco Group, Among Others. Analyze how the increased health concern among consumers is affecting the growth of the global market scenario. The product type that is expected to dominate the market.